David Kelley said these words at a talk at UofT, and they really resonated with me. On the morning of February 7, after a particularly challenging night, I threw myself into the ring of a public speaking competition. I have zero training in oration, but I suppose after teaching for a decade, the prospect of talking in front of a group is less intimidating than it once was. I’d been given the last-minute chance to enter the first round of a competition called 3MT – the Three-Minute Thesis – and figured I’d go for it. I’ll admit the first-place cash prize was appealing, especially given that I’m an unemployed graduate student. I was also attracted to the challenge of summarizing a complex idea in three minutes (brevity has never been my strong suit, I confess.). People call it an ‘elevator pitch’: a concise, clear, easy-to-understand explanation that will sell an idea or a concept. “Quickly explain it to your grandma,” someone explained it to me. There were rules – pretty strict ones. 3 minutes max, or I’d be automatically disqualified. No cue cards or script permitted. No props, no costumes, no audio or video ‘extras’, and I wasn’t allowed to sing or rap (ha!) or use any other theatrical approaches to speaking. I was allowed one static powerpoint slide as a backdrop, and otherwise it was just me and the mic. Two days before the event, I wrote what I thought was a pretty killer speech. Turns out it was actually an audience-killer: I shared it with some of my fellow grad students, and while they were supportive of the way I spoke, they admitted they didn’t really have a clue what I was talking about. My ideas were too confusing and vague, and relied too much on a presumed background knowledge of the audience. Their feedback was super-helpful. So the night before, I set about re-writing it from scratch. In an underground parking lot the next morning, I sat in my mom’s station wagon and rehearsed before entering the auditorium. There were about fourteen other entrants. The auditorium was large, and mostly empty. I was near the end of the roster. As a way to introduce some of my recent musings on education, I thought I’d share the speech. I fumble, and I let go of most of the threads by the end (I’d reached the limits of my short-term memorization bandwidth, clearly). Keep in mind these are preliminary ideas, based on cursory research, personal experience and intuition – but it’s a starting point. If I make too many generalizations about systemic poverty, please know that I don’t mean to paint everyone with the same brush. It’s a work-in-progress! If it’s too embarrassing to watch, I’m including a transcript of the speech below. In the posts to follow, I’ll build on these ideas and connect them to some of the bigger questions being raised about public education today. So here goes. In the next three minutes, I’m going to try to paint for you a picture of a preferable future, one with an especially big idea in it. Before I get to my proposed future, I’d like to give you a little context. 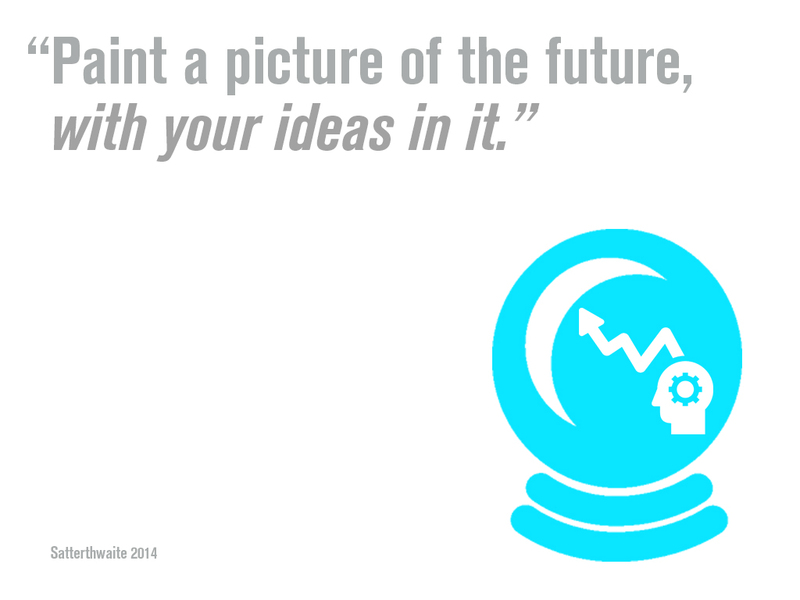 The fact that I’m even talking about the future – thinking about possible futures – is a privilege. It may seem strange to say that, but the reality is that there is emerging evidence that those of us living in contexts of systemic poverty actually struggle to think about the future. Being disenfranchised by the contexts of poverty limits our ability to think long-term. In my proposed future, I want to help change that — because frankly it’s inequitable and unacceptable to leave things as they are. 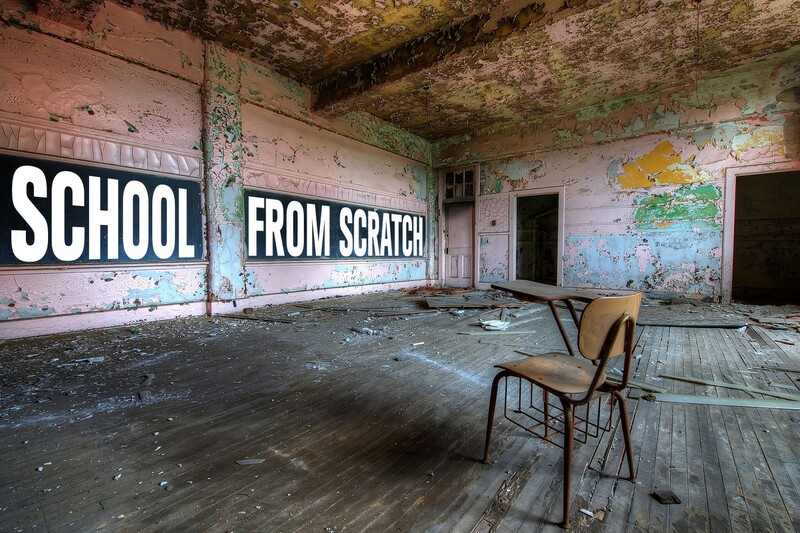 So here’s the picture I want to paint for you: it starts with a school. It could be any school in Ontario that serves kids who are entrenched in systemic poverty. So here is the really big idea. It’s simple: at this school, the poorest kids in the system are learning how to think about the future. If you’ve heard of Foresight, or Futures Studies, then you know this is a field that rigorously analyzes past and present societal trends to make informed, creative predictions about the future. It’s a specific set of methods being learned by some of the most savvy strategists, design thinkers and civil servants around the world today, to help inform present-day change. In my painting of this future school, kids are learning these skills. We’ll see classrooms with teachers who are trained in foresight methods integrating them into their teaching. We’ll see kids having conversations about history and current events, conjuring up informed and creative ideas of the future. We’ll see students envisioning the future, and it will give them a sense of agency, improved social/emotional well-being, and greater academic success. Young people who’ve never before thought long-term will be handed their right to a vision of their future, so that painting a picture of the future is no longer a privilege. Oh! I came in second place – and walked away with $500! The first-place winner, Marjan Verstappen, did an awesome presentation about her illustrative exploration of flora through bees’ eyes, and went on to the Ontario-wide competition in April at McMaster. *This isn’t totally true just yet, as I haven’t ‘implemented’ anything. But I’ll get there! In June, I’m assistant-teaching a futures course to gifted teens at Duke University, and hope to come away with some better-formed ideas about how to begin doing foresight work with kids and teachers in Toronto’s schools this coming Fall. If you think you know of someone in the system who’d be keen to explore this with me, please feel free to share this and point them in my direction. Amy – this research and thinking that you’re doing really speaks to me. I would love to be a test school for you and talk about these methods to teach foresight. It’s critical for students to have hopes and dreams. I am studying about how we can help students who come from situations of poverty evolve from a fixed mindset to a growth mindset, and how to explicitly teach those metacognitive skills that some students just “have”. Congrats! I love to hear someone speaking with passion, and to see you in the right zone.